It’s fall, the season of cozy sweaters, colorful leaves, and most notably, the famed pumpkin spice latte. Whether you willingly adorn yourself in layers of flannel to wait in endless lines for this cinnamon-topped delight, OR you loathe the mere mention of this orange-hued beverage, there’s no denying its popularity. 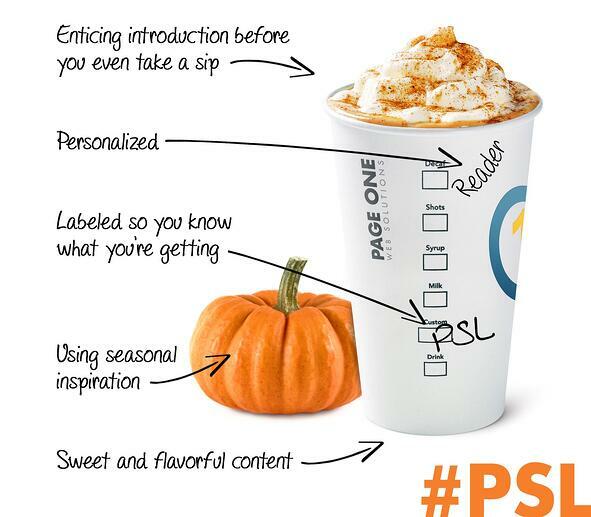 With the help of social media’s chief aggregator, the hashtag, the #psl has become iconic, surpassing the popularity of more traditional fall beverages like hot apple cider and plain old coffee. We know that not everyone loves this drink, but they love talking about it, so it’s trending. It’s that simple! Surprisingly, this blog isn’t about the contents of your to-go cup, it’s about the content you’re creating for your blog; which with a little creativity can become even tastier than anything a coffee shop can make. You’re not basic, and your content shouldn’t be either. I know what you’re going to say, writing is hard and you are busy, but creating original blog ideas that your readers actually enjoy and want to share is worth the extra effort. If a barista can create a cute little pumpkin design in the frothed milk of your latte, if that youtube vlogger can execute a perfect fishtail braid without looking in the mirror, if a cat can say “yasss”, then you can write a blog that people actually want to read. What I’m suggesting might sound odd, but if you take a few tips from the #psl you’ll find it easier to write, and your readers will be more likely to hit “like” and “share”. Let’s begin by examining our muse. Although we may think of whipped cream and cinnamon as just a garnish, on a pumpkin spice latte they serve as an invitation to take a sip. In the world of content creation, this sweet, fluffy topping is a carefully crafted title and an eye-catching header image. These powerful components attract the attention of your audience and beckon them to begin reading. To dig a little deeper, let’s consider the use of cinnamon. It could be sprinkles, it could be chocolate shavings, but no. It’s cinnamon because cinnamon is a key component of pumpkin spice flavor. Like the cinnamon, your blog’s focus keyword should be prominently featured in the title as a nod to the fact that it plays an important role in the content. Put simply, if you see cinnamon, you should taste cinnamon, and if you lead with your focus keyword, your readers will be pleasantly surprised to find it sprinkled throughout the content of your blog. It’s called a pumpkin spice latte, not a pumpkin cinnamon latte, so you can’t just saturate your blog with the same keyword and expect your readers to drink it up. Utilizing keyword variations is as important as blending the perfect combination of spices to build a unique flavor. Pumpkin spice is actually a mixture of cinnamon, nutmeg, ginger, and clove. These spices not only have similarities, but they compliment each other flawlessly. As a content mixologist, you should develop a short list of keywords, all of which are either synonymous with or closely related to your focus keyword. If your focus keyword is “pumpkin”, then your keyword variations might be “gourd”, “pumpkin pie”, “pumpkins”, “fall vegetables” and so on. By identifying keyword variations, you’re creating a rich context for your focus keyword, gently assuring readers that you’re well versed on the topic. The use of related keywords in the same family also helps Google guide readers to your blog organically, making it easier for searchers locate your content as they explore related queries. #PSL isn’t a thing all year. In fact, its unmatched popularity exists only during fall, beginning in September and lasting only through mid-November. Before the existence of the psl, these chilly months were known for the original iconic fall symbol, the unadulterated pumpkin. This plump, orange squash in its pure form has served as decoration on countless porches throughout history, its likeness shown in everything from greeting cards to seasonally-themed marketing materials. But how did the power of the pumpkin as a symbol of the season serve as a stepping stone for the birth of the psl? If you’ve never heard the expression “riding the coattails”, it’s when something feeds off the existing popularity of something else by developing a real or implied connection to it. If our goal is to make a drink as popular as the most famed seasonal icon, we need to build a connection to it. For the original creators of the pumpkin spice latte, it was as easy as adding it as an ingredient. For creators of content, the same methodology is effective, but the subject matter isn’t always as tasty. Coattails are so 19th century, so these days we follow hashtags to figure out what’s current and popular. If people are talking about something excessively, it becomes a hashtag and is shared as a “trending” topic throughout social media. By making one of these trending topics a key ingredient in our content, we can harness some of the interest that surrounds it. We can take this strategy a step further by not only focusing on hashtags, but also by choosing to target the seasonally-themed trends. Google values fresh, relevant content, and nothing exemplifies these things more than seasonal topics that are popular in the moment. Let’s say it’s December and someone claimed to see Santa’s sleigh. This #santasighting made the news and quickly went viral. Take this opportunity to spin this trend into your content. Not sure how this will work with your topic of choice? Try working the concept into an analogy that coincides with what you really want to write about. Let’s say you’re the owner of a mattress store. Tie your topic to the trend with a title like “Why Finding a Comfortable Mattress is as Rare as a Santa Sighting.” See how easy that was? Add some seasonal parallels into your writing, keeping the analogy active throughout the blog, and your readers will be wowed by your festive wit. Like a name jotted lovingly on your latte cup, there’s something so endearing about having something personalized - made just for you. Your readers agree, and they’ll flock to your content if it feels as if it has been created with their interests in mind. While developing personalized content takes more effort than scribbling a name with a sharpie, it’s definitely not as hard as it sounds. Begin by doing a little investigation about your audience. This can be done using market research tools which are often built into blogging analytics software. Find out if your audience is male or female, if they have families, even how much money they make. If you don’t have this sort of data available, you can take a more personal route and just ask! Pose a question on any one of your social media accounts and use the answers to shape your content. You can ask your audience what they like to do during the current season, or even be direct and ask what they would like to read about. When the psl was first introduced it was released as one of several “seasonal” flavors. It was ordered more than the others, so it gained popularity and the others faded into the background. If you’re debating between two topics for your content, share short posts relating to each and see which gets the most likes. The winner becomes your topic, and your taste-testers will be happy to see the return of their favorite flavor of content. Like the helpful drink-type-indicator key on the side of your cup, labeling different themes in your blog with concise headers helps your readers navigate your content. You’re the writer, so you know exactly what you’ve written, but consider that your audience wants at least an idea of they’re getting into before they devote their precious time to reading. You wouldn’t take a sip from a cup without knowing what was in it, so why expect your readers to blindly slurp up your words without so much as a hint about why they’re worth digesting? If applicable, headers are a great opportunity to utilize those keyword variations you identified earlier. In lieu of trying to label every paragraph, add a header each time you mention a different facet of your topic, making the transition easier for your readers, and seamlessly shifting their attention from one thought to the next. If your audience is kind enough to look at your content based on the intriguing title and headers, then the rest should be just as good if not better. Take the time to write complete thoughts, be creative, and offer your readers information that benefits them in some way. The pumpkin spice latte may not be healthy, but it’s flavorful, and people love that. If your content doesn’t offer value in the form of new information that your readers have never read before, then it should be presented in a way that is enjoyable to read. For information that might otherwise be boring, humor or an edgy perspective can be a valuable ingredient that keeps your readers interested and coming back for more. Whether you’re a seasoned content creator or you’re just beginning to write and want to start off with a bang, you owe it to yourself to make good use of the tools available to you. Stay connected to social media to see what’s trending, and visit Google trends at least once a week to see what people are searching for most frequently. With this data at your fingertips, you’ll be giving yourself a whole menu of options to choose from when you create your weekly content. If something is trending, find a way to relate your content to it as soon as possible, because others will do the same, and it won’t be trending forever! Make a habit of the tips above and your audience will crave the rich, relevant content you create and keep coming back for more!